Mikael Kjellman is an outdoor adventure sports who works as a design engineer and a bike lover. 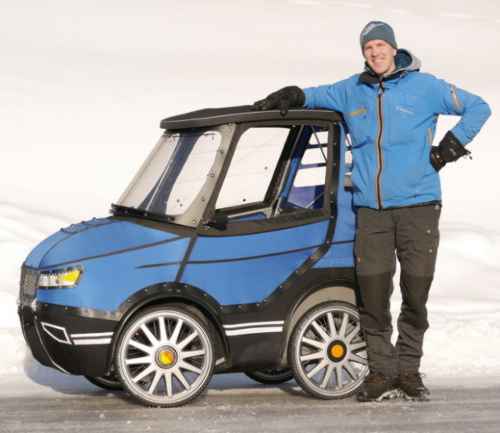 He has designed and built a four-wheeled e-bike with full fabric body to keep dry and warm in all-weathers. He has used it for the last year and now he is considering to move a step further and start a mass-process, being currently looking for funds (this website has no relation with this project and is not asking for any contribution at all. It is a mere information provided without further responsibility). He claims that his vehicle has approximately the same seating position and seat height as a small car, allowing easy access and good visibility in traffic. It has four wheels to be narrow enough for bicycle paths but still be stable in the curves. It has a full waterproof body to keep you warm and dry in any weather, heated windshield, soft seat with back support, air suspension and studded tires in winter. A small trunk for shopping bags and a tow bar for a bike trailer. The motor and control system are from a standard e-bike system and should make it a street legal bike in most countries. And may then be operated on bicycle paths and without a drivers license. Regardless where this initiative will end, it is quite clear that the vehicle market is evolving in the last few years.